Caesar’s is a fine place, a grand old warhorse of the Vegas strip. It’s probably known good times on its own, but is now part of the Harrah’s conglomerate of gaming properties. While the building seems tired, it’s clear that it has seen much refreshing and remodeling over the years.The gaming and shopping areas are opulent and clean, with very attractive eye-candy sight lines throughout the property. In the rooms, the marble bathrooms are luxurious, and the suite appointments are in good condition. 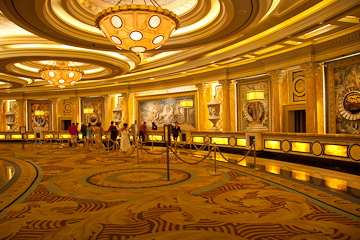 So why do I feel uncomfortable at Caesar’s Palace? Start with the key-locked gilded private elevator in my elevator bank in the Augustus tower. In the casino, everywhere you look are private exclusive gaming areas where you aren’t welcome. There are the empty lines for “Platinum” casino guests only, closed doors marked “7-star Registration,” a gold rope around the sports book seating for “VIP reserved” customers only. My wife drove back to the hotel on Friday to find the valet parking limited to “Platinum and 7-star guests” only. Sure every big Las Vegas casino has its exclusive services for the whales, and private luxury gaming areas and apartments. Certainly you want to encourage people to play more, and perhaps tease them with the promise of forbidden pleasures. But nowhere else on the strip have I been to a place where the number of closed doors seemed so plentiful or so obvious. Not at Harrah’s other properties, including the Rio, and Harrah’s Las Vegas. (Harrah’s casino is really a festival of the everyman.) The subtle hidden message is that Caesar’s is mostly for the whales. We might let you walk through our halls and play at our slots, but we really don’t want you here. Okay Caesar’s, I get the message!